NC4 had the famfest on saturday. Famfest is the first family event held by NC4 and about 90% of the members signed up to go. The event was held at this place called Tuscarora at the foothills at the Poconos. I was supposed to go but then the rain came and didn’t leave till the next day. 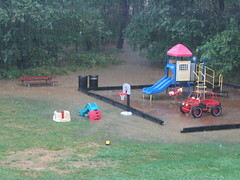 Here’s a picture of the flooded playground in the backyard. Today I attended the first research forum for this semester. Basically the research forum is where the doctoral students and professors of the Dept of Special Education gather about 3-4 times per semester. The main function of the forum is for the students to present qualifier proposals and results and get feedback from the faculty. There seems to be fewer and fewer doc student in the dept. This year there’s only 1 new doctoral student and she’s from Russia. Only 8 doc students attended the meeting today. I proposed my qualifier last semester and I have yet to really work on it yet. And because I took time to rewind all the videotapes at the Media Center, I missed the 7:10pm van back to Baby-ville. So that’s why I’m now here at the library to pass time till the next van which is at 8:10pm. Where’s Baby-ville? That’s the graduate student housing area where I’m living at now. I just called it Baby-ville because the place has so many babies and pregnant moms. 1. Get the surveys, business reply envelopes (BRE), and envelopes with return adddress printed at the Printing Services. I’ll send an email to Jose with all the pdf files attached and about 4 business days later I’ll get boxes of survey supplies. 2. Printing out address and coding labels. But first I have to enter all the participants info (address etc) into an excel spreadsheet, this step I did about 6 months ago. And I have to mail merge word and excel files to print out the mailing labels. 3. Photocopy invitation letters. Bringing 20lb color paper to the photocopy room. This is my only avenue of creativity in the whole survey preparation process…I get to choose the color of the paper 🙂 And then fold the invitation letter into thirds. 4. Stuffing envelopes with survey, invitation letter, and BRE. 5. Stick coding labels on the surveys..to keep track of who responded and who haven’t. 7. Send survey packets to the Mailing Room and they’ll seal and mail the packets. 1. 500 surveys sent out last week. 2. Another 150 surveys will be ready to be sent out soon. So I’ve prepared 650 survey packets in about 2 weeks. That’s my rice bowl.